Subtropical ecosystems are generally characterized by phosphorus (P)-deficient soils; however, extreme P-rich soils develop on phosphate rocks. We aimed to integrate metabolomic and ionomic analyses to survey how in situ trees adaptively respond to such contrasting P soils. Gas (GC-MS) or liquid (LC-MS) chromatography-mass spectrometry and inductively coupled plasma-optical emission spectrometer (ICP-OES) were used to analyze leaf metabolome and ionome of Quercus variabilis, which grew at two geologic P-rich and P-deficient sites in subtropical China. Two Q. variabilis populations were significantly discriminated in terms of metabolome and ionome, with major contributions from 25 identified metabolites (e.g. sugars and P-containing compounds) and P and four other chemical elements. And of these 25 metabolites, orthophosphate was predominant in influencing the variation in the metabolomes of Q. variabilis between the two P-type sites. Moreover, orthophosphate was correlated with leaf P (r = 0.85, p < 0.001), while leaf P was significantly influenced only by soil resident P at the P-rich site. Furthermore, the metabolic pathway analysis indicated four critical metabolic pathways: galactose metabolism, amino sugar and nucleotide sugar metabolism, glyoxylate and dicarboxylate metabolism, fructose and mannose metabolism. 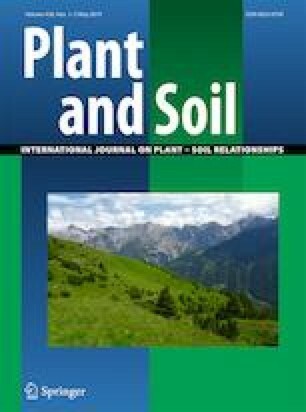 These findings suggested that there were distinct ionome-metabolome interactions in Q. variabilis populations, between P-rich and P-deficient sites, which contributed to novel insights into how plants interactively adapt to P-limiting soils. The online version of this article ( https://doi.org/10.1007/s11104-019-04020-1) contains supplementary material, which is available to authorized users. This study was funded by the National Natural Science Foundation of China (No. 31670626, No. 31270640, and No. 31070532) and the National Key R&D Program of China (2017YFC0505501). We thank the Instrumental Analysis Center of Shanghai Jiao Tong University for the support on chemical analysis. All data are included in the manuscript and the supplementary files, and all metabolites identified by GC-TOF-MS and UHPLC-QTOF-MS are included in the excel file named “ESM 2”. C. Liu designed the study, H. Ji, B. Du and J. Wen collected field samples and data, H. Ji performed the experiments, and H. Ji, V. Ossipov and C. Liu analyzed the data and wrote the manuscript.